Of the myriad reasons people vacation at luxurious beachfront resorts, getting out of the water to wait for a drink at the bar is not one of them; this is why choosing a hotel with a swim-up bar is mission critical. And to help you pick the best one, we've put together this handy guide to nine of the world's hottest pools with easy-access booze. 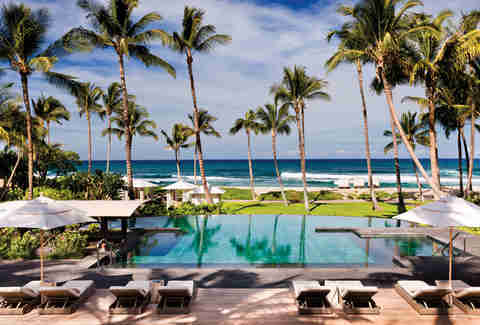 After shuttering for repairs following the 2011 tsunami, the Four Seasons Hualalai reopened with a new adults-only swim-up bar that's set on a sprawling lawn and overlooks the beach. Not only that, but the Palm Grove pool is 40ft long and offers guests both signature "shaved ice" and nature-inspired cocktails, as well as the chance to enjoy both without listening to screaming kids. 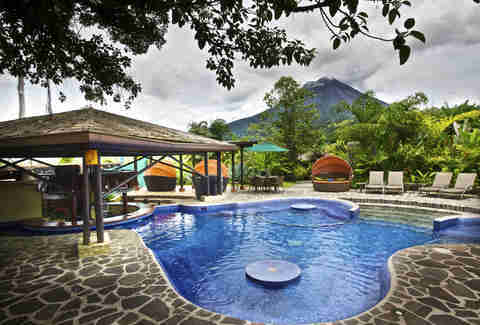 Tucked away in a lush, tropical landscape, this 15-acre, 56-suite resort stares right at the Arenal volcano. 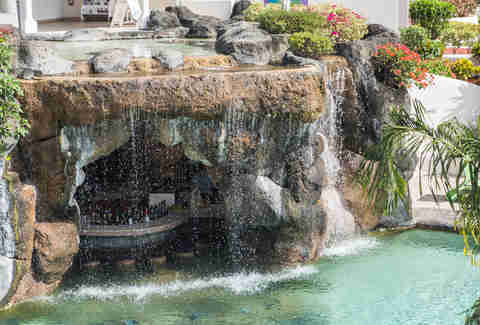 While it's easy to get lost wandering around the nature paths, you'd be well advised to follow the talking parrots and make haste to the the resort center, where -- hidden behind palm fronds and fountains -- you'll find the heated hotel pool and bar. An urban oasis in one of the world's most cosmopolitan cities, Room Mate Grace sports a ground-level indoor pool with adjacent steam room and bench-style seating. Not only can you swim up to your cocktails, but you can catch all the hot bar action from behind a window that runs the length of the pool. 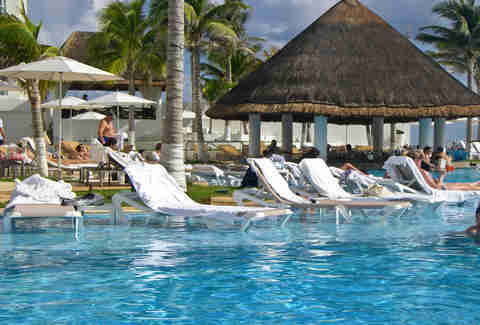 While there're no shortage of pool bars at which to party in Cancun, the 260-room Le Blanc Spa Resort eschews the wild and crazy sombrero-wearing, tequila-shooting masses, in favor of a quieter crowd. But while the palm tree-shadowed swim bar may be G-rated, that doesn't mean that free, premium-label booze isn't being poured. 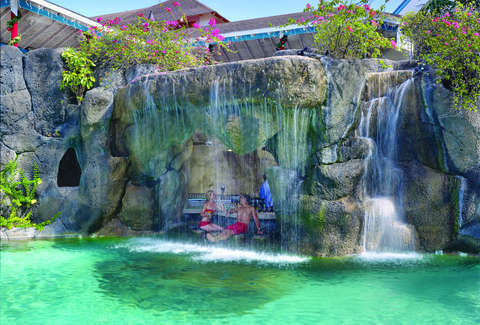 This all-inclusive resort features three lagoon-style pools, one of which rocks a swim-up bar tucked comfortably behind a waterfall and inside a cave! Yes, in a cave. There're only a handful of bar stools, though, so get there early, as saving seats for your buddies would clearly make you a... Neanderthal. 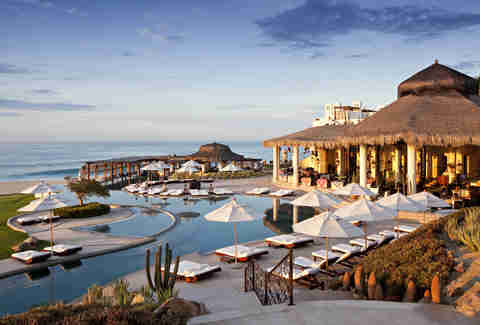 By far your best chance to catch a glimpse of Jennifer Aniston in a bikini, the celeb-stocked pool bar at Las Ventanas al Paraíso in Los Cabos (connected to one of the resort's seven infinity pools) attracts its fair share of A-listers, and not only pours a heavy dose of tequila 'tails, but also slings fresh sashimi and ceviche. While the InterContinental Bora Bora Resort & Thalasso Spa garners all the attention, it's her sister spot on the island of Tahiti that rocks the thatched-roofed swim-up bar. Set on a lagoon, this watering hole's built into Le Lotus infinity pool -- which has the largest sand bottom in the South Pacific -- and offers sweet views of the island of Moorea. If you pictured the isle of Mykonos in your mind (billowing gossamer linens, an illuminated electric blue pool, a woman enthusiastically fake laughing at a guy pretending to tell a joke), there's a good chance you're imagining the The Del Mar bar at Kivotos Club. Or at least this picture of it. 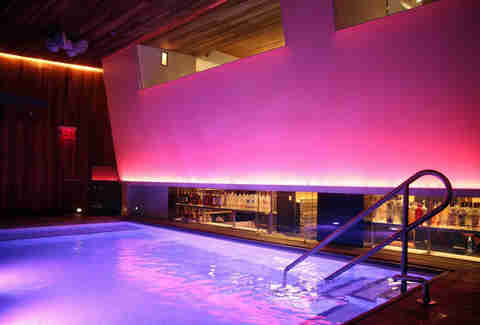 It's located in the hotel's main saltwater pool (there's an upstairs freshwater pool too! ), stays open well past your parents' bedtime, and sports in-water barstools and underwater tunes. Detoxing in a geothermal lagoon is much more relaxing with a drink in hand. 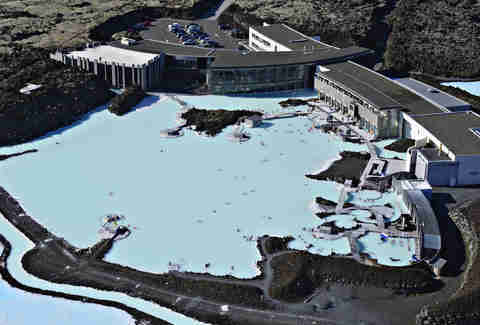 With that in mind, this famous Icelandic spa maintains an outdoor bar that not only allows you to charge in-water beverages -- like their signature blue curaçao cocktail -- to your entrance bracelet, but also peddles easy-to-apply volcano scrubs and algae face masks.